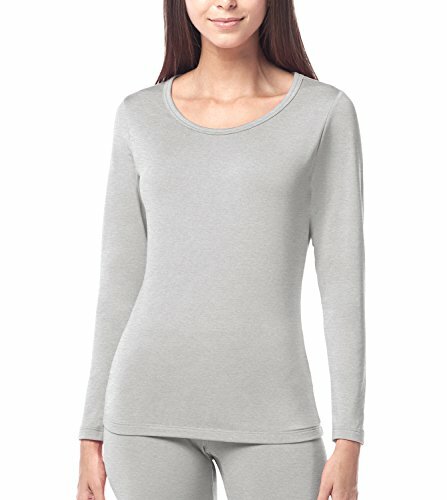 LAPASA Women's Lightweight Thermal Underwear Top Fleece Lined Base Layer Long Sleeve Shirt L15 (Grey, Medium) by LAPASA at Lamont Design. Hurry! Limited time offer. Offer valid only while supplies last. LAPASA long sleeve thermal shirts are made with micro-fleece fabric to give the ultimate warmth during the cold weather seasons. Made of a polyester and spandex blend, these thermal tops are light for layering under other clothes. These thermal underwear tops are designed to give you flexibility by hugging your body and stretching to move with you, they will keep you warm without sacrificing your range of motion or comfort. Snug fit ensures no bunching around your waistline or sleeves and reduces heat loss. Maintains original shape well even after many washes. If you have any questions about this product by LAPASA, contact us by completing and submitting the form below. If you are looking for a specif part number, please include it with your message.